A group of plants that are finding their way into Australian gardens, Podophyllum are a group of woodland plants commonly called ‘Mayapple’ or ‘American Mandrake’. In recent years this genus has been split into two with the Asian species being transferred to the genus Dysosma. These are another nice woodland ground cover plant that is a great addition to any garden. A number of species are worth considering for those with shaded gardens, they also make great specimen plants in containers. Although they do flower, it is the large textured or glossy foliage that we grow these plants. They thrive in filtered light to dapples shade, excellent for beneath deciduous trees, or in a shady part of the garden. Some research is being carried out as to the homeopathic use of the resins in this group of plants, however it is as a shade loving, ground cover garden plant that we find it useful. Podophyllum peltatum (Berberidaceae) or ‘American May Apple’ with nice bright green foliage Podophyllum peltatum makes a great ground cover for the woodland garden. Small white flowers held beneath the foliage in late spring followed by an edible fruit. Grown mainly for the foliage this is a plant that grows well in light shade where it will spread to form a clump over time. Although the plants do produce a small fruit it is the large palmate foliage that is the attraction, the yellow fruits are really just an added attraction. Podophyllum pleianthum is a species from China and Japan, with its large glossy foliage has foliage that appears on stems around 5 – 10 cm tall. The flowers appear which beneath the foliage make the plant a candidate for growing in a container. Flower colour is red however they do have have a faint yet unpleasant odour, not enough to distract from the great foliage. 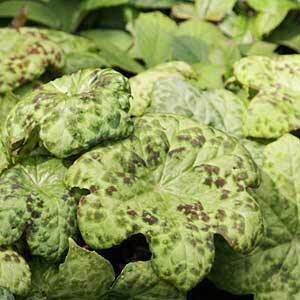 It is however Podophyllum delavayi is another species from China, and its cultivars such as ‘Spotty Dotty’ that are the real stars of this group of plants, the foliage is spectacular. Large mid green leaves with a blistered texture and deep brown to crimson red spots. A stunning addition to the shade garden. Take care when handling the plant as both the leaves and the roots are poisonous and an irritant to skin. Plants will reach around 50 cm in height before dying back in autumn. One of the great things about the species is that as long as it is grown in shade it copes well with dryish conditions. Excellent for planting beneath trees. Try a humus rich well drained soil. Podophyllum plants are available for sale from the following growers.